I’ll admit that I had no idea what I was walking into when I decoded I’d by a bass sax and learn to be proficient. Seriously, how hard could it be? The truth is that the bass is a saxophone but it’s also some very different. It is a resistance trainer, lung expander, wallet reducer, finger stretcher, backing breaking hulk of a horn and it’s quite fun to play. Firstly I am referring specifically to my bass a 1923 Conn stencil keyed to High Eb. 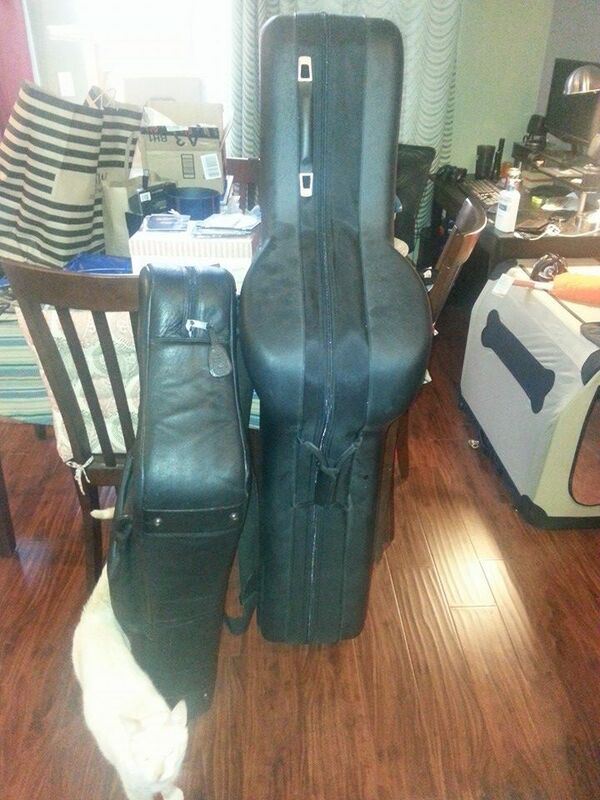 The old Conn and Buescher basses are the long wrap type. This means the upper portion of the horn doesn’t curl back on itself as much as baritone does making the main body tube considerably longer than the french wrap preferred by Selmer. French wrapped basses are more compact and more baritone like in their tone and timbre. Is any one type of bass better than another? Some say the long or American wrap has a bigger more booming voice whereas the French wrap blends into sections better and is easier to transport. I can’t speak the blend as I feel any horn can be made to blend but in terms of transportation I would have to agree. From the start the first thing you and everyone will notice is that the horn is big. It’s not just big it’s heavy. Weight is around 20lbs without the case and nearly 40lbs with the case. My low-A Yamaha baritone clocks in at 14lbs so it’s a big leap in weight. This larger size and weight stresses everything related to the horn: cases, neck straps, thumb hooks, horn stands, and lastly your body. Let’s take a look at these elevents marked for bass destruction. First up is the case. Considering the age of my horn  it’s no wonder it is not in it’s not in it’s original case. That case likely fell apart long ago under the weight of the horn, the elements and poor maintenance. Thankfully my horn came to me nestled snugly in the wheeled case seen in this post.This is the same case that Steve Goodson used to sells on his site. It’s made by a company in China, I believe JinYin. It’s pretty expensive, $1200, for a case but it does do a great job at shrinking the bass to size to fit in my Min Cooper. Yes, I can fit a bass in my Cooper. I could easily fit the remainder of the sax family in as well as long as I stack them. With that in mind be prepared to buy a new case if you are still using the old coffin style or vintage shaped case. Once out of the case and together you will need a method of holding the horn to you. I initially tried using the Neotech harnesses I use on baritone. those didn’t work as they didn’t have enough height adjustment to bring the mouthpiece to my mouth. On my bass the mouthpiece location ends up being about 6 inches lower than the baritone. The playing position places the mouthpiece at about half way down the horn verses at the top of the horn for baritone. This means any sax harness would need to have a great deal of vertical adjustment. Most harness don’t have this. have to return to using the tried and true neck strap. Neck straps have issues all their own separate to the pains in the neck they cause. A cheaper strap will usually have a nylon hook instead of a plastic coated metal hook. While this is great for protecting the finish it just isn’t strong enough to hold the bass. There is nothing worse than to have a horn go crashing to the ground because of a bad or broken nylon clasp. In examining my horn I saw that sometime in the past 93 years the thumb hook had been repaired, perhaps more than once based on slightly different solder colors. I suspect that it took a hit to the thumb rest perhaps during a fall. The weight of this horn amplifies small hits. It’s the classic equation of force = mass * acceleration. A heavy sax dropping, sliding, or falling onto a surface is going to cause damage to something. That something is going to be the sax or the surface it hit. As you might expect once you find a way to hang the horn from your person you will find that your body will develop some ache and pains. Good core support if vital if you want to play it suspended from your body. If you don’t then a good stand becomes the second most important purchase after your case. There are playing stands with wheels that allow you to position the horn for tooting while mounter firmly in the stand. There are also stands which are similar to baritone stands but have a much larger bell “U” to accommodate the larger bell of the bass. Saxrax has become the de facto bass stand for many players on the internet. Lastly, being a bass sax player requires a change in mindset. Depending on the type of music you play you may not have the lead line. If you are the bass of the group then you have to play like the bass of the group. Low notes alone are only part of the bass equation. You have to become a rhythm instrument as well as a wind one. This requires rhythmic playing and where a drummer is involved a connection to them. The bass and drums feed and compliment each other. The bass provides the foundation of the chords while also complimenting the drum rhythms. This takes time and practice. There are several great bass sax players on Youtube who exemplify this rhythmic and chordal duality. Bert Brandsma of the Dixieland Crackerjacks is the first that comes to mind. The second is Joe Rushton who played with Red Nichols and the Five pennies.